The sequel to Dragonflight and the second book in the Dragonriders of Pern Trilogy, Dragonquest substantially expands the range of featured characters. Where the first book concentrated almost exclusively on F’lar and Lessa, the second novel spreads its point of view far and wide. Masterharper Robinton, Menolly, F’nor, queen rider Brekke, and the boy who is to inherit Ruatha Hold, Lord Jaxom, all take center stage at one point or another, while the Weyrleader and Weyrwoman continue to expand their leadership roles. It begins nearly seven years after the initial events of Dragonflight with Master Robinton writing a ballad for the upcoming wedding of Lord Asgenar of Lemos Hold to Lady Famira, a half-sister to Lord Larad of Telgar Hold. (Larad’s half-sisters are complete contrasts, as Lady Thella in The Renegades of Pern proves to be quite a formidable villain.) He wants to include as many of the changes to Pern as possible, but he is bothered at the way the Oldtimers have failed to integrate into the new culture. Coming from 400 turns back and skipping the entire last Interval, they expect privileges that Benden and Southern Weyrs do not and they object to the forestation of the planet that requires them to work harder. This new world view that has blossomed during the last Interval–and championed by F’lar and Less–has disaffected them greatly. They are more clearly out of time and Robinton laments that F’lar did not take over leadership at the time they came forward. The old rule that each weyr be independent and separate is not really appropriate in this new time. As he write, Robinton hears a drum message notifying Fort Weyr that Thread is falling out of pattern. F’lar’s half brother F’nor, on a visit to the Smithcraft Hall, interrupts two Fort Hold dragonriders who are attempting to pilfer a knife from Fandarel’s assistant, Terry–a knife that was made on commission as Lord Larad’s wedding gift to Lord Asgenar. One of the men, T’reb, upset because his green dragon is ready to mate, assaults F’nor, stabbing him with his belt knife. F’nor is sent to the Southern Weyr to recover and F’lar confronts the Oldtimer weyrleaders with this crime, but T’ron cites the independence of the weyrs and frustrates F’lar. When they discover that Thread has been falling out of pattern and that the Oldtimers failed to inform them, their frustration grows as the Lord Holders worry about possible damage to their property. Recovering in the Southern Weyr, F’nor gets to know Brekke, who is the secondary weyrwoman there, rider of queen Wirenth, subordinate to Weyrwoman Kylara, whose queen dragon is Prideth. However, Kylara is vain and wanton. She has delegated almost all of her duties to Brekke, who also serves as the chief nurse at Southern and is fostering a teenage girl, Mirrim. Gradually, F’nor falls in love with Brekke and worries about the prudishness of her Farmcraft upbringing, just as she worries that she will inhibit Wirenth when her queen rises to mate. F’nor begins to wonder if Canth might possibly fly Wirenth. Even though he is only a brown dragon, he is as big as many bronzes. Sleeping on the beach one day, Canth informs him that a newly hatched queen fire lizard is hovering about seeking food. He speaks softly to her and gives her a meat roll from his pouch, Impressing Grall. He has Canth call back to Southern Weyr for other riders to come Impress the other hatching fire lizards who are turning cannibal with the lack of food on the beach. Brekke impresses a bronze, Berd, and Mirrim Impresses two greens, Reppa and Lok, and a brown, Tolly. Kylara was absent during the Impressions, as she was bedding the evil Lord Maron of Nabol, and she is furious that she doesn’t have one. She decides to haunt the Southern beaches and find her own clutch. When F’lar is visiting F’nor, Thread falls and he and Mnementh join the fighting. Afterward, he discovers that there is no sign of Thread infestation and investigates. He discovers that Southern has a kind of grub that eats Thread. Four major events occur in Dragonquest that alter the future of the planet. The first event occurs when Lord Warder Lytol and young Jaxom come to visit Benden Weyr. Felessen, the son of F’lar and Lessa, takes Jaxom back into the long abandoned caves of the weyr to a secret place where boys go to view Ramoth’s eggs. Finding a small one all by itself, Jaxom touches the egg. Fearing discovery, they head back, but their glows wink out and they are lost in the darkness. Jaxom accidentally pushes a button that opens a door. The trapped gas knocks the two boys out, but the adults are all extremely excited by the stuff that the original colonists left behind in the room. They find a microscope and begin to wonder if there might be a way to alter it so that one could see the Red Star close up. Later, T’ron discovers a telescope at Fort Weyr. The second major event happens at the wedding of Asgenar and Famira. F’lar and Lessa arrive with fire lizard eggs to give to the happy couple as gifts. They arrive just before Meron and Kylara who now both have their own fire lizards. Fandarel has developed a “distance writer,” a kind of primitive telegraph and it reports the news that Thread is falling, so F’lar decides to join the other Oldtimers in fighting it. When T’ron learns this, he grows angry at F’lar for interfering in another weyr’s affairs and they duel. F’lar severely injures T’ron and gives a passionate speech asking for the weyrleaders, lords, and craftmasters to swear their allegiance to him and they do wholeheartedly. He banishes the Oldtimers to Southern where they can do little damage and decides to move the current dragon folk from Southern to High Reaches Weyr. Even though he is injured, he goes to fight Thread anyway. In High Reaches Weyr, Wirenth rises to mate, but Kylara’s Prideth is at Nabol while she is bedding Meron. 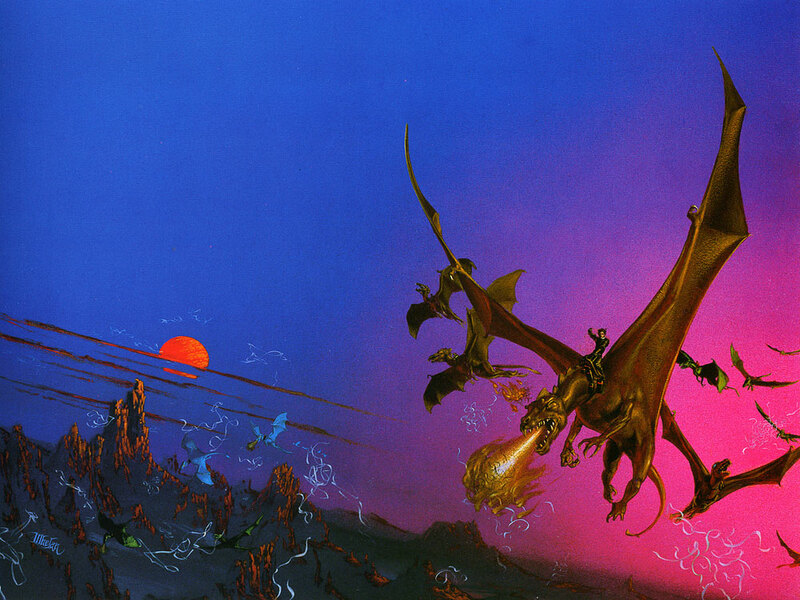 In high heat, Prideth challenges Wirenth’s mating flight and the two dragons fight in mid-air. Both severely injured, Wirenth takes Prideth into between and they both die. Brekke goes into a deep depression and Kylara goes mad. The third major event occurs at the hatching of Ramoth’s new clutch of eggs. Lessa has put Brekke into the pool of girls hoping that she will Impress the new queen and recover from her severe shock and depression. This is the point at which Dragonsong, the first novel in the Harper Hall Trilogy interconnects with the main trilogy. There are two accounts of the hatching, one primarily from Jaxom’s point of view in Dragonquest and one from Menolly’s point of view in Dragonsong. Although Brekke does not re-Impress, her little fire lizard, Berd, challenges Ramoth by entering the hatching grounds chittering at Brekke. This breaks her out of her depression and she does not Impress the new queen. However, once the hatching is over, Jaxom watches the little egg he had touched earlier rocking and shaking as if the dragon was trying to break out. When no one responds, he jumps into the hatching ground and breaks the shell, cutting the sac with his belt knife. A little white dragon falls out and Jaxom impresses Ruth. The fourth major even of the novel happens because the lords are all anxious for the dragonriders to go to the Red Star and eradicate Thread at its source. Not understanding the breadth of space or how big the Red Star actually is, they continue to press for this venture. F’lar himself would like to go if he could only see it well enough in the telescope at Fort Weyr to be able to jump between. Lord Meron is at the viewer night after night trying to give coordinates to his little bronze fire lizard, but the creature is so scared it just jumps between. Watching, F’nor discovers a could formation on the Red Star that is easy to visualize. He gives the coordinates to Canth and they jump. The atmosphere of the Red Star is hot and poisonous. Canth broadcasts their distress back to Pern and every fire lizard in the world picks it up. Through Ramoth, the word is broadcast to all of the dragons who come to Benden Weyr to form a living bridge to ease the battered bodies of F’nor and Canth back to earth. At the Harper Hall, in Dragonsinger, Menolly’s nine fire lizards all go berserk and wake everyone up. The book ends with F’lar conducting a successful experiment with relocating grubs from the southern continent into the Lord Asgenar’s forests at Lemos. When the lords express discomfort that dragons may be no longer needed, F’lar intimates that dragonriders may use their time exploring the southern continent or even the other planets in their system. Obviously, from the above brief plot summary, a great deal happens in the novel. The simplicity of F’lar and Lessa’s relationship in Dragonflight has been replaced by a much deeper and broader story line. The introduction of Masterharper Robinton and Mastersmith Fandarel in the first book is expanded out to include many other craftsmen and the push toward innovation dominates the society. There is an obvious need to have not just the weyrs, but the rest of the planet under one leadership and F’lar and Lessa, with their farsightedness and liberality are clearly the ones to do it. Although F’lar respects the Oldtimers for their contribution to saving Pern, they are clearly out of step with a society that is moving forward. The economy is now thriving, especially with the additional forestation, and Fandarel is moving technology ahead with both his own inventions and by using the discovery of material the original colonists had carefully packed away for future use. Both the discovery and seeding of the Thread-eating grubs and F’nor’s trip to the Red Star move the plot along in the direction of ending the menace of Thread forever. Most important of all, the book moves the story from borderline fantasy firmly into the realm of science fiction. A planet was colonized by humans, dragons were genetically engineered from the fire lizards, and, following the collapse of the society into a medieval technological state, the humans are beginning to discover their roots and the level of technology that their ancestors brought to Pern. The broadening of the characters to include Robinton, Fandarel, Menolly, Jaxom, F’nor, Brekke, Mirrim, as well as the Lord Holders Larad, Asgenar, Groghe, Corman, and the personalities of the dragons and fire lizards gives the book–the whole saga–a depth that sets it apart from most other science fiction franchises. The third book of the trilogy, The White Dragon, dovetailing with the third book of the Harper Hall Trilogy, Dragondrums, expands the story to such a level that it begins to reach a nearly mythological level. I find it utterly confounding that no high level film or animation has–to this point, at least–been shot and released. I think that the story would have great appeal and not just to the Young Adult market. In addition, there would be a whole market for products based on the Pern dragons, fire lizards, and the deeply appealing characters. Hopefully, something good in the cinema will eventually come from this terrific saga!